Scientific theory* suggests that once a person has been exposed to a cold virus, the virus attaches to receptors in the upper respiratory system and replicates. It’s further believed that zinc ions released into the throat compete for these same receptors and thereby prevent the cold virus from reproducing. The virus dies off faster and the cold ends sooner. Zinc gluconate is the active ingredient in Cold-EEZE®, the #1 pharmacist recommended zinc cold remedy and the best-selling zinc lozenge. Unlike some other zinc remedies, the Cold-EEZE®unique zinc gluconate formula does not contain additives that might interfere with the release of zinc ions. 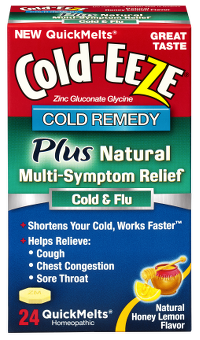 Cold-EEZE® zinc gluconate cold remedy is free of artificial colors or preservatives. 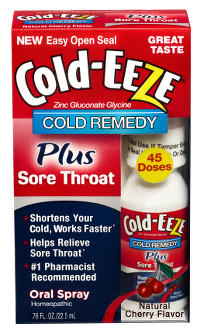 Cold-EEZE® Cold Remedy Oral Spray Plus Sore Throat is formulated with zinc gluconate, the same effective active ingredient found in the best-selling, clinically-proven and #1 pharmacist recommended Cold-EEZE® cold remedy lozenges. Not only is our Oral Spray Plus Sore Throat convenient, it’s also a great value too! Each bottle contains 90 sprays, that’s 45 doses of Cold-EEZE®! 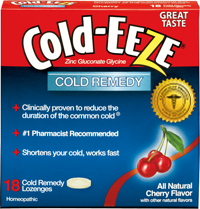 Cold-EEZE® Cold Remedy lozenges are one of the best cold remedies to shorten the duration of a cold. Our lozenges have been clinically proven to shorten the duration of the common cold by almost half. The efficacy of our best selling lozenges is backed by double-blind placebo-controlled studies conducted at both the prestigious Cleveland Clinic and Dartmouth College. This season we are excited to introduce the new Cold-EEZE®Cold Remedy Plus Natural Multi-Symptom Relief Cold and Flu QuickMelts®. This over-the-counter cold remedy shortens your cold and also contains additional active ingredients that provide natural multi-symptom relief of cold and flu symptoms. This unique formula reduces the duration of the common cold and helps relieve cold and flu symptoms such as cough, chest congestion, and sore throat. About a week ago my husband started to have cold like symptoms. He was so stressed out because he had meeting after meeting lined up at work that he couldn't miss. He was also stressed because several people at the office had a cold and he knew it was a bad one because many people had called off work for 2 or more days. At the first sign of symptoms he began using Cold-EEZE® Cold Remedy Oral Spray Plus Sore Throat, Cold-EEZE® Cold Remedy Lozenges and New Cold-EEZE® Cold Remedy Plus Natural Multi-Symptom Relief Cold and Flu QuickMelts®. He had symptoms for about 2 days and then was on the mend. Many people at the office who were sick before him are still under the weather with the same cold. I 100% credit his quick recovery to the products and am so thankful that he was able to fight off the beginning symptoms before they really even turned into a cold. He was able to continue working, keep all his meetings and knock out the cold in just a couple of days. I am also thankful that no one else in our family came down with it and also think that was because he was able to fight it off so fast with the help of Cold-EEZE. Usually the whole house gets sick but because he never fully got sick and got over the beginning symptoms so fast he didn't leave a trail of germs to infect us. 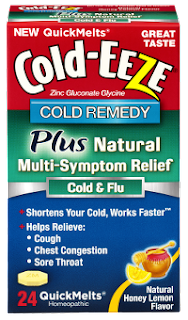 Thank you Cold-EEZE for keeping my family healthy! Click HERE to find out about other Cold-EEZE products. Follow Cold-EEZE on social media!